First of all, let me extend my warmest welcome to all of you. The Chinese Embassy and China Foreign Languages Publishing Administration are delighted to have you with us here for the formal launch of the book Xi Jinping, The Governance of China during the London Book Fair. The forty-year-old London Book Fair is the most important spring gathering of international publishers and one of the most influential global book trading platforms. Today's launch of the book Xi Jinping, The Governance of China is both a highlight of this prestigious book fair and a major event in China-UK relations. This book is a compilation of works of President Xi Jinping. It embodies President Xi's governance philosophy. l to strengthen all-round Party self-conduct. These new governance measures have drawn increasing international interest in how they will influence China and indeed the world. Xi Jinping, The Governance of China is a collection of works that record the President's thoughts and practices in governing China. For those who may have various questions and doubts about China, this book offers an authoritative response. For those who would like to learn more and get a better understanding of the country, this book opens a window on today's China. Through this window, readers will be able to see where China has come, where China is going, and what kind of road the people of China will take in pursuit of development. This book has all the answers to these questions. In the book, the President expounds on the nature of the Chinese Dream. It is a dream of prosperity for the country, renewal of the nation and happiness for the people. He shows the world that the people of China have taken a development path of their own choice with determination and confidence. He shares a vision of the great renewal of the Chinese nation. He explores China's time-honoured cultural tradition, unique historical mission and complex national condition. China will inevitably follow a development path that is suitable to the country, or in the words of the President, "wear the shoes that fit". And what fits China is socialism with Chinese characteristics. His analysis on these important issues reveals China's complete strategic thinking, clear roadmap, coordinated action plan and strong leadership in breaking through development bottlenecks and turning the nation's vision into reality. Through this window, readers will also be able to see China's view of the world. They will be able to understand China's sense of responsibility as a member of the international community. They will be able to appreciate how the Chinese Dream and the world's dream go hand in hand. Twenty articles in five chapters of the book were devoted to diplomatic strategy and international relations. Here, one can read about President Xi's propositions and philosophy on regional and international affairs. There are clear explanations of China's views and solutions on global issues. There are pledges and aspirations of China to share opportunities with the international community and seek common development, common progress and common prosperity. Over the past two and a half years, President Xi has taken 11 overseas trips and visited 31 countries. He has met with some 300 foreign heads of state or heads of government either in China or during overseas trips. He has also attended over 20 important events of multilateral diplomacy. These high-level diplomatic activities have taken him to all five continents and different types of countries. President Xi has stressed on many occasions that China will steadfastly pursue peaceful development. l China will never seek hegemony. l China will never follow expansionist policy. l China will never pursue interests at the expense of justice. l China advocates the idea of community of common destiny. l China advocates the principle of amity, sincerity, mutual benefit and inclusiveness in its relations with neighbours. l China advocates a new type of international relations built around win-win cooperation. 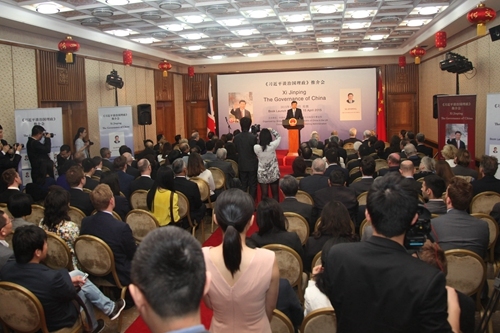 l China advocates the building of the Silk Road Economic Belt and the 21st Century Maritime Silk Road. These new ideas and new initiatives reflect centuries-old Chinese wisdom. They are a clear-cut announcement of China's resolve to pursue peaceful development. They are a passionate expression of China's sincerity to share the benefits of its development with the world. They are a courageous demonstration of China's vision and sense of responsibility. As we can see from President Xi's diplomatic philosophy and practice, they embody a distinct Chinese characteristic, Chinese touch and Chinese style. Also through this window, readers will appreciate President Xi's wisdom, charisma and leadership style. As the Chinese idiom goes, a man is what he writes. 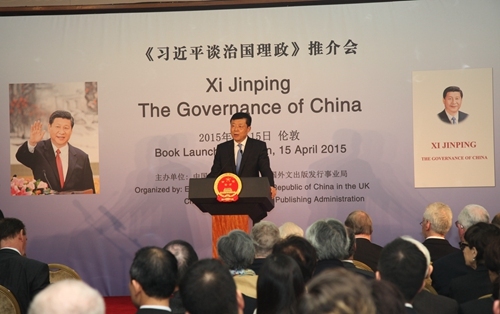 President Xi has a literary style that is sincere, candid, unadorned and vivid. This is accredited to the many years he spent living and working at the grass roots level and going back to the roots of the Chinese culture. In the speeches, talks and interviews in this book, President Xi always takes an easy-to-understand approach to profound concepts. He has a way with big ideas and abstract theories, always able to find small words and vivid examples to get the message across. His deep roots in tradition and genuine appreciation for different cultures can also be felt in the great care he takes to bridge gaps and highlight the linkages between different civilizations. Readers of this book will certainly have an opportunity to appreciate the quality and charisma of a statesman in close range as well as to benefit from his wisdom, his knowledge and his natural, candid and modest style. 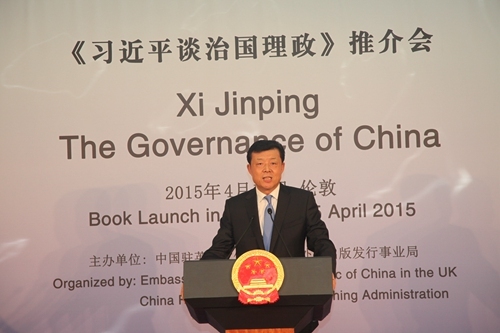 These are the essence, the significance and the fascination of reading the book, Xi Jinping, The Governance of China. As President Xi put it, both China and the United Kingdom are major countries with global influence. Our two countries have extensive common interests and shoulder important responsibilities for world peace and development. We are now in a golden time for China-UK relationship. There have been one good news after another since the beginning of this year – from the successful royal visit by the Duke of Cambridge to UK's announcement on joining AIIB, from fruitful business cooperation to flourishing events of the China-UK Year of Cultural Exchange. Now, with the launch of the book Xi Jinping, The Governance of China here at the London Book Fair, it is one more good news for people here in Britain who want to learn more about today's China. And this will certainly further strengthen the mutual understanding and trust between China and the UK. In conclusion, let us look forward to the forthcoming state visit by President Xi Jinping at the invitation of Her Majesty Queen Elizabeth II. Let us wish the visit success in outlining a new vision and writing a new chapter for China-UK relations.